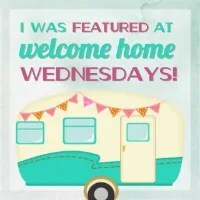 Welcome to Welcome Home Wednesdays #32!!! So EXCITED that spring is finally here! I love seeing the tulips come up and all the fun spring-like projects everyone is working on. Thank you for hosting Erin! Have a Happy Easter!!! Thank you Katrin. You have a happy Easter too! You’re welcome, Joanna! Thanks for stopping by. Love seeing you here! Thank you for hosting! Have a lovely week and happy Easter! Thanks so much for partying with us, Kim!! See you next week! Thank you for hosting! I enjoy your party so much. I would love for you to party with me at #ThursdayFavoriteThings. Please leave me a comment with your link # so I can be sure to visit. Have a great Easter! Thanks, Marilyn. I will check out Thursday Favorite Things When I’m back in town next week. Erin, thank you so much to you and the ladies for hosting! Wishing you and your family a very happy and wonderful Easter! Thank you, Cindy! I hope your family enjoys the holiday. Cheers! Hi Erin, Thanks for hosting the lovely party dear. Thanks for joining us this week, Sadhna! See you next time. Thanks for hosting! Have a lovely Easter! Thank you for coming by, Sherry! We love having you! Glad to be a part of my first Welcome Home Wednesday. I linked up 3 posts. Will comment on 6. I followed all the hosts on Instagram!